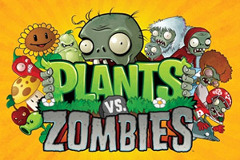 One of the most enjoyable online slots to have been released this year, the Plants Vs Zombies slot machine is a feature rich, humorous slot with random bonuses and a mega progressive jackpot winnable from any of the bonus feature games. With stakes from as low as 20p, any spin can offer the chance of the progressive jackpot which often pays between £20,000 and £50,000 on this 20 payline slot machine. Features are awarded from landing two bonus symbols on reels one and three, and a third symbol on reel five which will name the feature. Although the value of the features varies, all are able to award the progressive jackpot. Cherry Bomb Freespins: A great fun freespins bonus game with marching zombies out to eat your brains. The feature ends when the zombies reach your house, but they can be destroyed by landing three bonus symbols during the bonus round. To win the progressive jackpot you need to land five trophy symbols across the reels. Zombie Bonus: This is a fun little picker game set on three levels. Pick a vase to reveal prize values, or find Crazy Dave to progress to the next level. Additional, one of the vases may contain the progressive jackpot which will pay the £30,000 or so and also let you continue the game! Zen Garden: Anyone who knows the concept of Deal or No Deal will recognise this feature; select a plant then either collect or carry on in the hope for a better offer. The gold trophy will pay the progressive jackpot on this feature. A progressive picker type feature. Choose one of five watering cans to water your plant which will grow with each watering and thus award an ever increasing amount of money. If a zombie is hiding in your can, the feature is over. If a gold trophy is in your can, hit the town because you’ve just won the progressive jackpot. This is one of the best slot machine currently available online. The fact that the progressive jackpot can be triggered from any bonus further adds to the excitement, and as well as the chance for the huge prizes, random zombie wilds can appear during any spin to create mega prize amounts.